To put it simply, blog fans are brand fans. As part of the POPSUGAR 2015 Blog Influence Report, we partnered with CJ Affiliate by Conversant to understand the role that blogs and bloggers play in women's shopping and purchasing decisions by surveying over 2,500 visitors to POPSUGAR and ShopStyle. We learned that 92% of women have positive associations with the brands that they read about or see mentioned on blogs they visit. 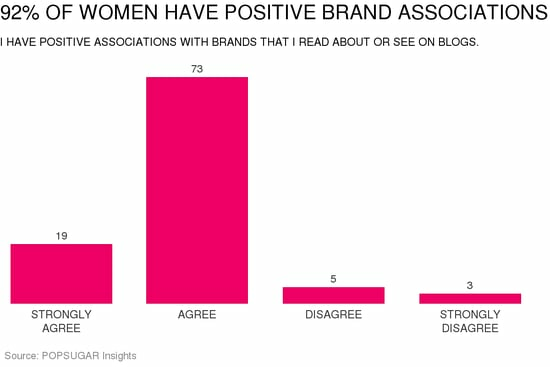 Nearly one in five women strongly agreed that they have positive associations with brands featured on blogs and nearly 73% agreed with the statement. Additionally, 57% of women are likely to purchase a product from a brand after first seeing it mentioned on a blog they read or follow. Over 48% of women said that a future purchase of the brand was likely and nearly 9% said that it was extremely likely.